A girl of seven, she is the protagonist of the story. She is a rational girl who sees the world as stable and orderly. Her adventures in Wonderland frustrate her but they also open her eyes to the magic around her. A worried and frantic creature, the White Rabbit is crucial since he first guides Alice into Wonderland. He is manic yet shy. He is, on occasion, a little dangerous. We get our first clue about the madness of Wonderland by the White Rabbit. A tyrannical and maniacal ruler of Wonderland, she represents the most cruel of irrational impulses. Though she makes little sense like every other character, her nonsense is quite dangerous. He rules alongside the Queen, yet he is ineffectual. The King poses little threat but he is unlikeable, and he is perfectly willing to go along with the Queen’s ruthless impulses. The magical cat who seems to hand in the air and disappear leaving only his grin. The Cheshire Cat explains the nonsense and insanity of Wonderland. 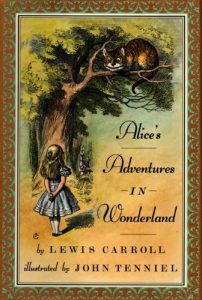 He is important because his explanation shows the since Wonderland is ruled by nonsense, Alice’s rational view of the world makes her insane by the standards of Wonderland. Mad and sane become confused in the Cheshire Cat. The Queen’s ugly cousin. The Duchess is rude to Alice at first, but then attempts to be so friendly that she makes Alice uncomfortable. Again, in Wonderland, what appears one thing soon becomes its opposite. Although he ends up being helpful to Alice, he is also another figure who appears menacing. Sitting on top of a mushroom smoking a hookah, The Caterpillar is rude to Alice and treats her with contempt.